If you can’t find the answer to your question here, contact us on 1800 344 448 to speak with a member of our team. Does DIG IT Civil service my area? What is the cost for a site inspection and quote? How long will the site inspection take? Do I need to be home? Do you do residential or commercial work? Can I carry out my own excavation? Will the excavation damage my property, or that of my neighbours? Do I need to arrange insurance? What is a float charge? What is a tip fee? What permits and approvals do I need? Do I need to do a ‘Dial Before You Dig’ assessment? What is the minimum hire period? Do you charge extra on Sundays, Public Holidays and for night work? Can I get a better rate if I order more than one machine? What attachments are available for your excavators? What do your waste removal fees include? 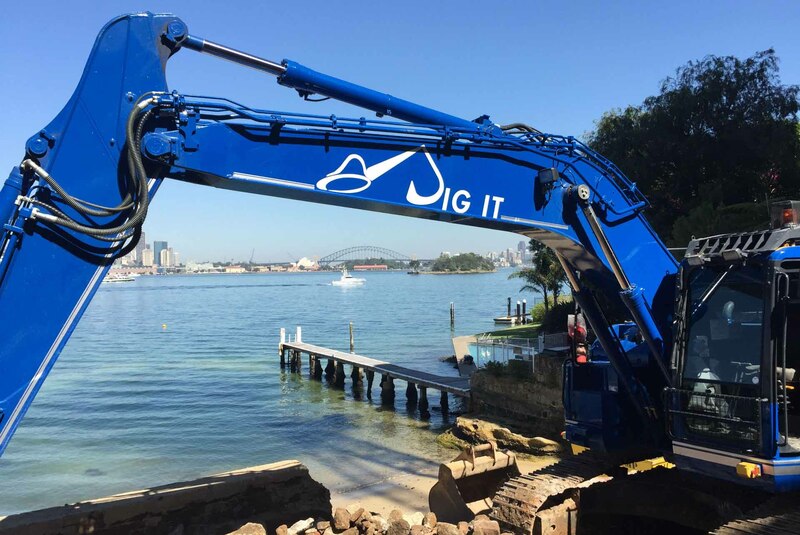 Our head office is located in Mascot and we service all areas of Sydney and surrounds, including the Eastern Suburbs, Lower North Shore, Western Sydney and Greater Sydney areas. We can also travel to the Central Coast if required. Our central location means you will save on transport fees and receive next-day delivery of our machines. We are open Monday to Friday from 6am to 5pm. Saturday and Sunday hours are 7am to 2pm. The operating hours for our machinery will depend on the times outlined in the Development Application (DA) provided by your local council. We will ask for a copy of your DA before works commence, so we can plan a work schedule that complies with these operating hours. The cost of your project will depend on a number of factors, including location and access to the site, the size and scope of the job, the type of materials that are being removed and other factors like traffic and security. Once we talk to you about the project and complete a free site inspection, we will provide a quote for the project. This is the cost you will be asked to pay, unless you change the scope of your project or request extra work that was not in the original quote. We offer a free site inspection for every client, regardless of how large or small the project may be. There is no obligation to proceed with the quote we provide, so you are free to compare our rates with other companies and choose the best option for your needs. Contact us if you have any questions about a quote you have received or would like to book a free site inspection. Our site inspections are very thorough and usually take around 30 minutes, depending on the size of the site and the nature of the project. There is no need for you to be at the property while we are conducting the inspection, as long as our team can gain access to the site. You will receive a written quote within two business days of the inspection, with an estimated timeframe and next steps. We have a large team of operators and an extensive fleet of excavators, posi tracks, trucks, skid steers and attachments. This allows us to work for a range of clients, from individuals doing home renovations to commercial companies and large government bodies. This is dependent on the type of project, size and (of course) your experience. It is not advisable to carry out any large-scale excavation projects relating to structures. For this, it is always best to bring in the professionals due to a number of reasons including: hazards such as excavation collapse; the costly exercise of hiring the equipment and the expertise required to operate it; and the risks involved in digging and coming across the unknown such as pipes. We will provide you with an estimated timeframe in the quote, based on the information you provide us and our assessment of the property. The timeframe will take into consideration the equipment used, the materials that need to be moved and any waste disposal that needs to occur. On average, smaller projects usually take between one and five days, with larger projects taking between five and 45 days. Any delays such as bad weather or unexpected rock in the ground can extend the timeframe of your project. Other factors that can affect the completion of your project include traffic, school zones, the location of the job and its proximity to waste facilities. Our goal is to provide you with the highest quality service in the shortest amount of time, with minimal impact on the environment. We have specialty attachments and conveyor belts that allow us to access small properties without damaging the garden, fence, home, driveway or neighbouring properties. If we believe that adjustments to your property, or the surrounding area, need to be made to complete the project, we will inform you beforehand and make sure everything is restored to its original condition before we leave. We maintain premium levels of insurance for our equipment and staff, who are fully licenced and qualified to operate our machines. Our team are extremely careful while on site and aim to leave it clean and tidy when they leave. If an accident does occur, we guarantee that we will repair any damage to your home or property caused by our work. We also have workplace health and safety policies in place, as well as a detailed pre-work checklist to make sure everyone stays safe while on site. A float charge is the cost of transporting the machine or any attachments to and from the work site. Unlike many companies, we can transport our own machines, so you will not need to arrange a third-party contractor to get the equipment to your property. Our float charges are competitive and you can save time and money by transporting additional equipment in the same delivery. Our team can pick up the machines as soon as your project is complete, so they do not hinder the next stage of construction. If your project exceeds one day, you will only be charged one float fee if you can securely store the machines on your property or have onsite security. A tip fee is the cost of disposing the waste generated from the job site at a waste facility or landfill. This fee covers the government tax and Environmental Protection Agency (EPA) levy, which is charged according to the weight and type of waste you are disposing. It is important to make sure you have all relevant permits and approvals before starting your project, otherwise council fines and penalties may apply. We can help you determine whether you need a Development Application (DA) and what other regulations you need to consider. Your local council will also have information on how to seek approvals for your project. Dial Before You Dig is a national referral service that helps you understand where underground utilities such as cables and pipes run underneath your property. It is very important to do this assessment before commencing any excavation or construction works, to avoid injury and damage to your property or local services. You can complete the free assessment by visiting www.1100.com.au or calling 1100 during business hours. Our team is also happy to do this for you as part of our pre-work checklist. We will need the information of any underground utilities beneath your property before commencing work. If you need to cancel your booking for any reason, we require at least two hours’ notice, otherwise a travel or float charge will apply. In the case of wet weather, you are required to contact us and cancel at least two hours in advance. If the team is already at the job site and you need to cancel, a minimum of four hours hire will apply. This depends on the type of machine you hire, but usually you will need to hire our equipment for a minimum of eight hours on the first day of your project, with a minimum of six hours for each day thereafter. For more details, view our rates. 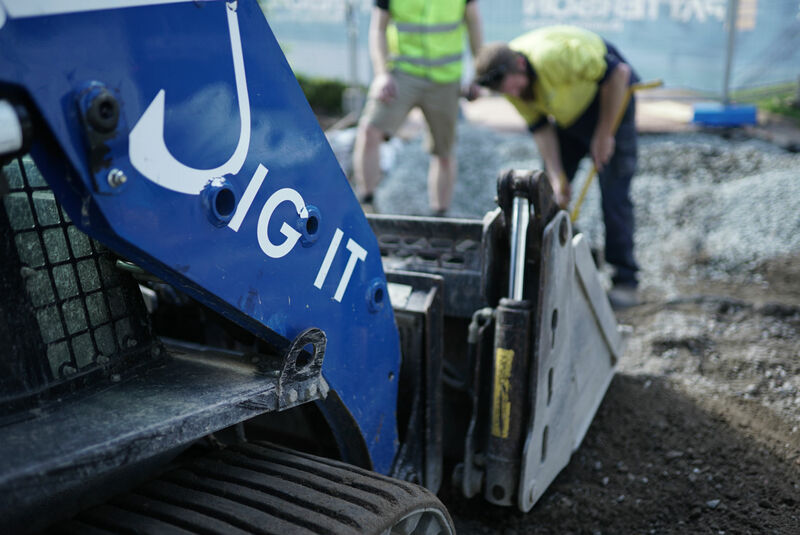 It is your responsibility to cancel your DIG IT hire in wet weather. We require at least two hours’ notice, otherwise a travel or float charge will apply. If we are already onsite, a minimum of four hours hire will apply. Do you charge extra on Sundays, Public Holidays, and for night work? Yes, there is a $35 per hour surcharge for all equipment and operators working on Sundays, Public Holidays, and at night. Yes, we are happy to provide you with a quote for combination hire on all machines, trucks and attachments. Contact us for a free site inspection and quote on your project. 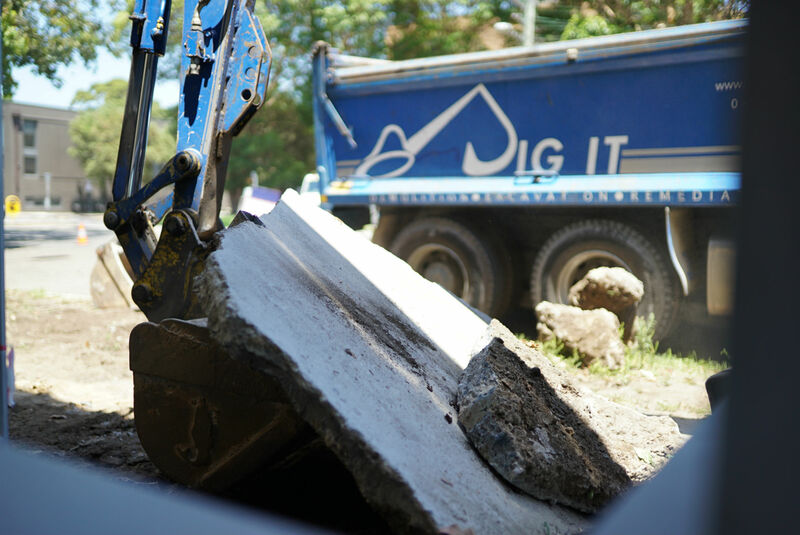 DIG IT can remove waste from your property to prepare the site for the next stage of construction. Our waste removal fees include float charge, truck and equipment hire and tip fees. Your quote will be based on a per load or per tonne rate, depending on the type of materials that will be removed. Payment in full is required by the due date specified on the invoice. We accept cheque, cash, Visa, Amex and Electronic Funds Transfer (EFT). Credit facilities are provided to approved customers only.